BranchOut’s professional network cratered when Facebook muted its virality. Today the $49 million-funded startup is hedging its bets with the launch of Talk.co, a mobile-first web, iOS, and Android messaging app for coworkers that looks like Yammer and WhatsApp’s white-collar love child. 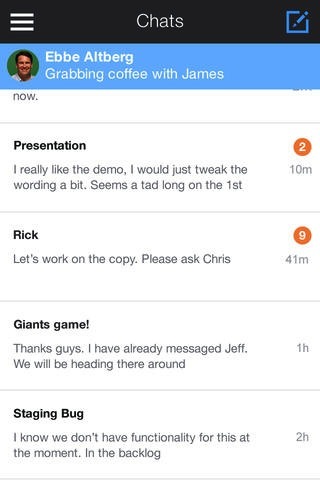 Talk.co ditches Yammer’s passive news feed for a list of message threads that get your colleagues to respond faster. BranchOut grew to a whopping 33 million users with its namesake Facebook app that helps you find friends or friends of friends to refer you for jobs. But when Facebook cut off the spammy wall posts it employed for growth, and its desperate attempt to become a real-time stream of your professional accomplishments failed, its engagement withered. “It’s not a failure. It’s still alive,” BranchOut founder and CEO Rick Marini pleads. BranchOut has been stripped down to more of a professional search tool that the startup will try to grow. But “active users aren’t very big right now,” Marini admits. You sign up for Talk.co on the web, iOS, or Android with your work email address, which the service then verifies to ensure you’re really part of the company. Once you’re in, you get a buddy list of all your coworkers. You can send one-on-one and one-to-many instant messages or set up a chat room for “Engineering,” “Marketing,” “After-Work Fun,” or whatever you want. Instead of posting to a news feed like with Yammer, Convo, and other workplace collaboration tools, you send text, photos, and links directly to each other. Each message delivers a (mutable) notification to its recipients. That makes Talk.co feel more urgent and increases accountability. CC me on a Yammer post and I don’t feel compelled to respond. Message me and two other coworkers on Talk.co and I’m likely to feel like it’s my responsibility to reply. And since I can reliably see who is actively online in Talk.co, I know who to reach out to for immediate help. That means Talk.co could boost workplace efficiency. It could also increase collaboration and connection between colleagues without forcing everyone to hand out their phone numbers. Sally from product might not want to give Jim from sales her cell phone number, but Talk.co could ensure Jim can ping her after hours if her new feature is preventing his ads from showing up right. It’s also a cleaner, less spammy channel than email, which keeps queries from getting lost. Marini tells me Talk.co will be free at first, but will likely start charging for premium services and larger organizations on a per-seat per-month basis. Similar to Asana’s model, a few employees can try it out for free, and only need to persuade their CIO to pay when Talk.co has proven its value and they want the rest of the company on it. Talk.co certainly benefits from simplicity and familiarity. Most people have used a group messaging app and this works exactly the same, just exclusively with coworkers. And it does feel more nimble and likely to inspire real-time collaboration than feed-based tools. But chat also gets messy quickly. It’s tough to remember what each thread is about when it’s a conversation, not a post with a series of comments. Chat makes people feel almost too comfortable, leading them to prattle on and socialize when they should be focusing on work. It might be tough to find important old threads too as there’s no search feature in the mobile app yet, though Marini says he’s working on it. The big question is whether the fluid nature of chat’s speed is worth sacrificing the perceived permanence and importance of posts to a feed. Each company will have to answer that for themselves. In August we caught wind of Talk.co because Marini was strangely beta testing it at BranchOut.com. That led us to think they were pivoting entirely. While Talk.co is now the company’s and Marini’s priority, BranchOut will continue to limp along. BranchOut’s investors were supportive of the reallocation of resources to Talk.co because the startup’s $49 million in funding meant it had years of runway — plenty of time to experiment with something hot. That’s how they see the workplace communication space because of two big trends: the shift to mobile, and the Bring Your Own Device movement. Tools built web-first don’t necessarily translate to the small screen or harness its strengths. Meanwhile, companies are tired of paying for extra mobile devices for their employees, who don’t want to carry a second one anyways. They’d rather use their own phones, and Marini hopes he can get Talk.co installed on them. “We’re in the third inning”, Marini tells me, likening his startup to a baseball game. “The first inning we got out there and grew incredibly fast. The second inning was tougher. Facebook made changes to the developer platform that affected everyone. In the third inning, we’ve reacted to that and focused on utility.” If Talk.co can convince professionals that it can deliver the ease of consumer messaging with the security and purpose of the enterprise, BranchOut might still be able to eek out a win.